This is for the Silver Edition. The Copper Edition is no longer available. But hey! We lowered the price of the Silver by $600!! Now with WBT Speaker Terminals!! Reviews are coming in and reviewers are in love with the new Special Edition with its specially designed and built transformers which overcome traditional issues with the 300B. 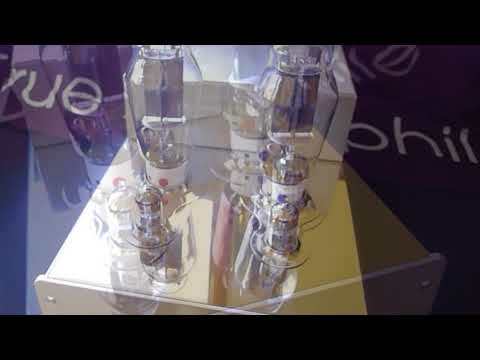 "If you enjoy greater transparency and more emotional content from your music you should experience what a single-ended triode amplifier can really do..and if you are considering investing in a quality valve amplifier with 21st century looks and reliability, … the Audion Silver Night Special Edition deserves to be placed pretty high up on your audition list. … Lucious, transparent midband combined with a sweet treble have been enhanced by excellent choice of components, solid silver point-to-point wiring, ultra clean power supplies and superb matching of high-quality transformers, wound in-house. The traditional weakness of triodes has been transformed, and in particular strong bass abilities are genuinely very impressive. Audion took their award-wining 300B amplifier and completely redesigned it. From its new circuit to specially designed 300B output transformers, it totally eliminates any 300B shortcoming. Excellent bass, superb sub bass, fast paced and fabulous dynamics along with brilliant transient response. More headroom, about 35% in fact. Frequency response with included tubes is 8hz - 32Khz +/-3 db or 17hz - 24Khz flat line. 8.2 watts Pure Class A per channel. Quite possibly unlike any 300B you’ve ever heard. Completing this sonic feat is an all new chassis design by one of Europe’s top designers. The Audion Silver Night 300B Special Edition are all hard wired and hand built. This amplifier was a huge hit at the August 2014 California Audio Show. No one could believe the sound. Attendees came back again and again to marvel at this new amp's dynamics. Other exhibitors came into the room asking to replace their expensive 300B amp with an Audion Special Edition. No one could believe how linear this amp makes a 300B tube. Aside from brute force, the 300B Special Edition reproduces subtleties and nuances in music that cannot be found in other amps of this price. Auto biased and a very conservative watt ratings which is equal to almost twice their rating if tested by competitors methods. NOTE: Exclusive to USA Models. The driver section is specifically designed for the US market to provide fuller sound. Better impact, speed and attack. Only the US model has a 5687 driver section. This triode based stereo amp uses no (zero) feedback in the design. This Audion Silver Night Anniversary is best suited for use with loudspeakers of 92db or better efficiency. Having a volume control on the front and stereo inputs on the rear means that a pre-amplifier is not necessary with this unit. The 300B amp comes with JJ300B tubes. The 300B gives a good overall sonic performance from a well know tube. Ohm tapping requires specially winding the output transformers can be changed on request, FREE. Either 4/8 Ohm speaker terminals or 8/16 Ohm. Please state preference when ordering. As the Audion brand name is so well known this is one of the most popular selling amp in our line-up and the one that wins hearts and minds of customers and reviewers. The current Audion Silver Night Special Edition is now a 6th Generation product, originally being sold in 1987. It was rated "Amp of the year in Japan" and has rave customer and professional reviews. Thoroughly recommended." -- HiFi Choice (top) UK Audio Magazine 2015 Read full review here.